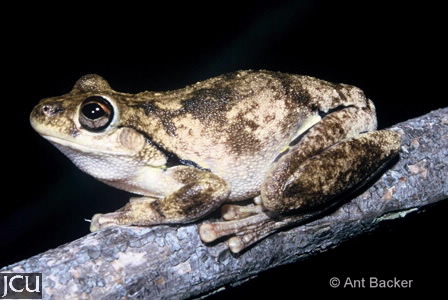 This frog has a whitish body which is mottled with small iridescent green spots, belly is off-white. A distinctive feature is the yellow and black patterning on the hidden part of the thigh. The colour of any one individual can vary with the time of day. Fingers are half webbed, toes are nearly completely webbed. Some individuals may appear ‘putty-coloured’ as in the photographs below.